Since man has been sailing the oceans, the arrival of nightfall offshore has evoked an avalanche of emotions including, but not limited to, fear, awe, awareness, insignificance, and even faith. Being on the ocean with a carpet of stars overhead gives even the toughest sailors a sense of how small their part in the universal plan really is. The sights are incredible: stars, a path of moonlight, meteors, man-made satellites and a necklace of shore lights 12 miles away are all treats the daytime sailor will never experience. The challenge of navigation and safe passage are guaranteed to invoke a feeling of pride and accomplishment, rewarding those who have taken the time to prepare properly. If you’re planning to extend your sailing into hours of darkness, here are some considerations. Preparing entails three areas: the boat, the equipment and the crew. Care for these and you will add a new dimension to your sailing experience. This will not only be rewarding in your local area; it will make longer passages in limited time available to you. For you racer types, seeing those “double points” for overnight races going to waste will be a thing of the past! This part is really an extension of something you should always do. Have your boat ready to deal with any eventuality, including getting stuck out after dark. Running lights must be checked for proper function and be appropriate for your size boat. This might suggest some upgrades to your boat’s existing lighting. If you plan to replace any lights, consider LEDs. They are more expensive, but that extra money buys freedom from the tyranny of running your engine at night to keep the batteries charged. Carry both Coast Guard-approved and more serious SOLAS flares. Consider the Coast Guard requirements for your size boat and if the new lights will fit properly on your pulpits. Mount your bow lights as high on the pulpit as practical. Mounting your stern light on a radar mast, rather than the stern pulpit, gets the light higher for better visibility and at the same time reduces glare in the helmsman’s eyes. An excellent source on lighting, and other matters, is the Boater’s Guide to the Federal Requirements which is a free pdf online; either use your search engine or go to uscgboating. org/assets/1/ workflow_staging/ Publications/420.PDF. If your budget allows, consider a tri-color masthead light. Although not a replacement for proper deck level running lights, they offer a step up for a vessel while under sail. Make sure they are installed so that they can be run independently of the deck level lights and the compass light. Running both deck level and tri-color is illegal and confusing to shipping. Mount a radar reflector; they work, like a light, to make your boat more visible. Know how to use the controls on all of your instruments. Compass lights are one of the most common failures on sailboats at night. Make sure yours are working dependably and you have a plan if they go out. As visual clues go down with the sun, a compass becomes more important. Have a back-up compass with a light. While the safety regs allow a hand-held compass to fill this requirement, it would be a major hardship trying to steer a boat with one at night. Make sure your engine is recently serviced and totally dependable. Plenty of fuel, coolant, fan belts, alternator, water pump, etc., should all be checked before an overnight trip. It’s so much easier to fix things at the dock, during daylight. Check your batteries. Running at night increases loads, and can result in failure of a battery that will work OK under less load. Carry tools you’d never carry around the buoys. They might be essential on a night passage. Use glow-in-the-dark paint or tape, or highly reflective tape, to make critical closures, like hatch latches, or safety gear, apparent in limited lighting. One online company, glowfast.com, offers products and suggestions on where to use them, both for safety and for racing. Know where all thru-hull fittings are and be able to find them “by feel.” Stick-up battery powered LED push-on lights are readily available, but should be considered only a convenience item, as they are often unreliable. Study the deck carefully and see if there’s any gear that might come loose at night and either be lost overboard or foul the prop if motoring. Also check for tripping hazards or snag points for lines. Remember the axiom to Murphy’s Law; “Nature always sides with the hidden flaw.” At night almost everything is hidden! Having good, reliable equipment on your boat becomes even more important at night. Make sure man overboard (MOB) lights, poles and equipment are working and up to date. Equip Lifeslings with water- activated lights. Have a throwable device with a water-activated light ready for immediate deployment. Make sure all crew have up to date PFDs with lights and whistles. 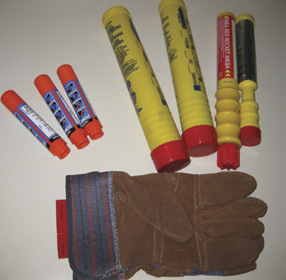 Have flares, still in date, for Coast Guard requirements and more serious SOLAS flares in case they are really needed. Today’s marine electronics are like computers. Each year they gain in functionality, but at the price of ease of use. Practice using each piece of electronic equipment in the dark. Although the display may be lit, many of the knobs and controls will not be. For this reason some of the older designs, like hand-held VHFs with analog controls, are actually better at night. “User friendly” becomes a function of darkness. guides before considering a night passage. Electronics should not only have night lighting but also the ability to dim them. Find out what keystrokes are needed to dim the lights or brighten them when needed. Many GPS plotters have the questionable feature of using the power switch pushed briefly, then arrow down to dim the lighting…a little too long on the power switch and you’ve turned it off. Learn to use all of these features, well before you go on your overnight. 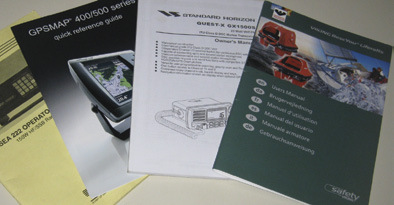 Read the manuals (either hard copy or online) while at home. You’ll probably have lots of those, “Oh, that’s how you do that” moments! Learn how to turn off the “keyboard beep” function, so your boat will be quieter for the off-watch. Having the GPS, plotter, and other electronic controls near the helm is more important at night. Having to go down below to check your position when the off-watch is sleeping might not be the best choice. If you use an autopilot you must be extremely cautious, and compulsive about keeping your safety harness clipped on. 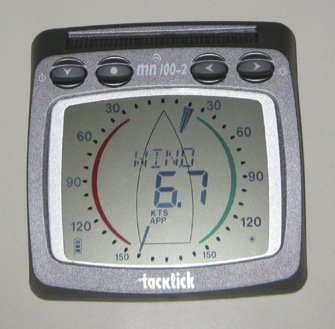 If your boat is equipped with advanced systems like DSC or AIS, learn to use the basic features first and have them down cold before you try to master all of the advanced features. For instance with DSC, ask yourself, “If I were sinking, what’s the minimum I could do to take advantage of the system?” Usually it’s just one switch under a protective panel. Other features like “group calling” can wait. 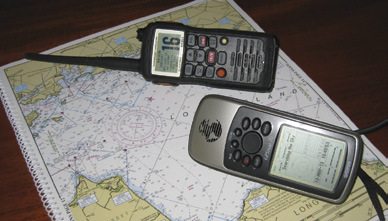 Similarly with AIS, learn to view a target’s info quickly, his boat name and “closest point of approach” (CPA). Calling a ship by name is monstrously more effective than, “Ship south of Block Island, this is sailing vessel Maryann!” If you do contact a ship for “collision avoidance,” ask him what you can do to stay clear. He’ll tell you what will make his job easier, which is exactly what you want at that time. Equip your galley to be “night friendly.” By this, I mean have things easy to find and have low-level lighting available that will allow you to work in the galley without waking off-watch crew or blinding the helmsman. If the stove is difficult to use or the weather is going to be rough, have Thermos bottles with hot coffee or hot water available and snacks that don’t require cooking. on/off, volume and squelch may be easier to use at night. Have flashlights stored where they can be found in the dark; big ones for big jobs and small ones for when you don’t want to disturb sleepers or the helmsman. Before night falls, hook up the cockpit searchlight, and stow it within reach of the deck crew. Headlamps can be great for having both hands available but if you use one, always turn it off before you turn your head to talk to someone; even a red light will blind the other person if pointed in their eyes. Equally important in the preparation process for sailing at night is the crew. Don’t make your first night passage single-handed, and don’t race at night before your crew has practiced drills in total darkness. The big difference in sailing at night is obviously visibility. One thing that changes dramatically is dealing with objects in the water. These are harder to see, and because they come into view when much closer, the decision on how to deal with them must be made more quickly. Picture a log in the water. During the day you would hopefully spot it early on and either make a small course correction or know that you are going to clear it. At night, by the time you spot it, it will already be pretty close, so in a few seconds you will have to: evaluate what it is you’re seeing (is it a log or a whole tree? ), judge which way to best adjust the course (going one way may cause a jibe, or current may be going strongly one way), and take action in such a way to least upset your course, but still clear the obstruction. One way you can lower your risk is to go slower. This can be accomplished by what used to be called “short’ning down” at night…kind of an old term but it still has relevance. By putting up a smaller jib before night comes on, you accomplish several things. One is to lessen the chances that you’ll have to do a foredeck exercise in the dark when crew will likely be tired and not at their best. Second, by using a smaller jib your visibility forward is greatly increased. Third, a small jib makes tacking a lot easier with fewer hands. At the same time, by slowing the boat you have more time to deal with obstructions. Having one person dedicated to navigation (NAV) has proven itself, whether on a sailboat or warship. This keeps the helmsman from being distracted by navigational issues and keeps the navigator focused on the big picture. The navigator should put together a series of waypoints to keep the boat in safe water before the passage begins. 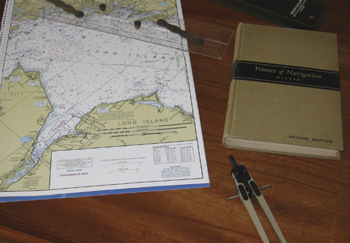 The term “waypoint” brings to mind GPS, but the same process applies to paper charts and compass. NAV should be aware of what lighthouses, lit buoys, unlit buoys, shallows, and basically anything that will be seen during, or threaten, the boat’s passage. of navigational techniques, old and new. Beyond the issue of navigation is keeping a lookout for other boats. This may be the toughest part of learning to sail at night. The book model of seeing a red and/or green nav light and one or many mast lights usually doesn’t work out that simplistically. You obviously should have a good knowledge of ships’ navigational lights and there are many books (COLREGS is the basic one) out there as well as lots of stuff on the Internet, including one at usboating.com/testlights.asp with a little online quiz. Once you’ve mastered the lights, putting them in use becomes a little less clear. Ships often have lots of deck lights, many of them brighter than the nav lights, making it hard to discern what angle you’re looking at. The best visual method is to track the magnetic bearing from your boat to the ship. If the angle appears to be moving either to your left or to your right you’re probably OK, but if the bearing is steady the ship is on a collision course with you. Sounds kinda scary, and it will be until you have a lot of experience with it. Taking bearings from a small sailboat with a lot of motion is hard to measure. The ship, who may be watching you on radar, has a much better idea if he’ll pass ahead or astern. Show lights on your sail first and then in the general direction of the ship, ideally not at his bridge. 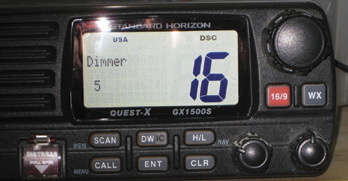 Try calling on VHF 16 or if local radio traffic is heavy, VHF 13. Give your location, relative to a known point (off Pt Judith 3 miles north of 1BI) and who you’re trying to talk to (to the westbound tug and tow). Keep it simple. And if you give your latitude and longitude, don’t take it out to three decimal places; one tenth of a mile is close enough and easier to copy. Equip your boat with AIS and it gets this easy: “Oshima Maru, this is the sailboat 3.7 miles on your port bow.” By then, you’ll know his CPA is half a mile and calling him becomes just a courtesy call. No different than daytime sailing but AIS makes it a lot easier, because like radar or GPS it effectively extends your vision. 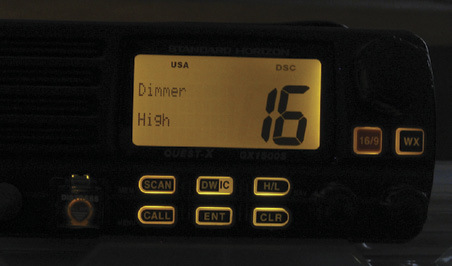 A receive-only AIS built into a nice Standard VHF will cost you less than $400. If you have a plotter at your helm it’ll put the ship and all necessary info right on your screen. So, know the “old way” but don’t leave home without your AIS! Another element of crew prep is to make sure you and your crew have cold weather gear. It can get mighty cool on the water at night in New England, even in summer – throw in some fog and it’s downright cold. Multiple fleece layers, long johns, insulated boots and gloves, and a watch cap will serve you well at night, especially wrapped in a good set of foul weather gear. Maybe the most important aspect of sailing at night is sleep management. Make sure you and your crew get sleep when you can, to be ready when all hands are needed. Even taking turns napping in the cockpit, in full gear, and tethered on, can extend your operating efficiency. Don’t be tempted to snooze with the autopilot on; it can and has been disastrous! Don’t attempt getting into a tricky harbor at night! Take a slow tack offshore until daybreak. Keep your harness clipped on at night, no matter how inconvenient! When sailing at night there are many considerations that, although similar to daylight sailing, have a slightly different twist because of limited visibility. Many consider sailing well offshore as the safest venue as there are fewer things to run into. The range of things to hit is relative to your distance from shore. Starting from land itself, it goes: shoals, rocks, fish traps, lobster pots, buoys, other small boats, islands, larger fishing boats, and ships. There are always exceptions of course, but when choosing your course, these considerations play a part. During daylight you might choose to stay close to shore, for the view, and reduced interaction with shipping. But at night, you might want to change your approach to be in more open waters. This means you have to up your game in dealing with commercial traffic. Showing a willingness to change your course to accommodate a commercial operator will reap benefits in keeping you safe. Make course changes early and obvious so the other boat understands your intentions. 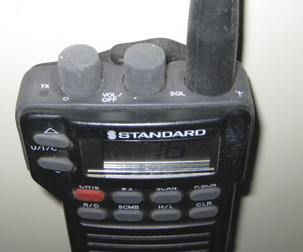 Spend lots of time listening to VHF 13 prior to your overnight sail; understand the language and the concerns of commercial operators. It will help you have a productive conversation when the time comes. Before the race, do a real overnighter out to some point 50 miles or so south of Block Island. Stand watches, practice MOB drills, practice reefing, practice trimming sails at night in either light or heavy air. Get everyone, especially your watch captains, comfortable dealing with traffic and fishing fleets. Learn where the trim marks on halyards and sheets are. Practice with that new top-down furler. You can’t practice reefing in the middle of a race, and you may need it sometime. Know where you are and practice meticulous navigation. Understand what you are seeing in terms of lights or things in the water. Make sure your boat can be seen. Don’t wander off course, and make course corrections positively and clearly. When relieved, report any lights or traffic to the oncoming watch. If at all possible, don’t close with land at night. Know and practice nighttime MOB procedures. Maintain a greater distance from hazards than in daylight. Take all this into consideration and when you feel you’re ready, pick a good forecast and give it a try. The rewards of sailing at night are many, and the risks can be managed with careful planning. If you’re not quite ready, find someone with more experience to take you out on his or her boat or come along on yours. Approach it seriously and professionally, and you’ll soon be doing an overnight cruise to Maine or competing in the Greenport Ocean Race under a canopy of stars! And yes, it does sometimes rain at night. Be prepared! A sailor since the 1970s, Ernie Messer is a member of the Cruising Club of America, Off Soundings Club and Shennecossett Yacht Club. He and his wife have sailed New England for many years and have also raced to Bermuda frequently, including three times double- handed! They sailed for 15 years on their Tartan 41 and now sail on a restored Peterson One-Ton, Valour, out of Westbrook, CT.